Pimenta dioica is an evergreen tree and was discovered by Christopher Colombo. Its origin lies in South and Central America. Nowadays the finest Jamaica Pepper comes from Jamaica. The Evergreen tree grows 9-12 meter in height. Its berries the All Spice are harvested green before they reach maturity from July until September. The Jamaica Pepper is dried in the sun where they change their color from red violet till brown. The bouquet of Allspice is a combination of Cloves, Nutmeg and Cinnamon. Allspice is used in Desserts like Plum pudding or pumpkin pie. 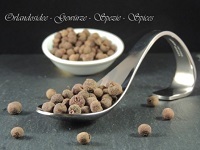 Allspice is also used in marinades, terrines, smoked or canned meat.